Po.st allows user to share content via Facebook, Twitter, StumbleUpon, LinkedIn, email, and other destinations. Po.st also provides publishers with new revenue opportunities and comprehensive analytics tools designed to drive higher engagement and lower customer acquisition costs. For example, publishers can tap into RadiumOne’s client list of advertisers to fill their remnant inventory at rates far higher than they can source from exchanges, according to the company. Po.st can also show a display ad after a user has shared content, with publishers able to keep 100 percent of this ad revenue. 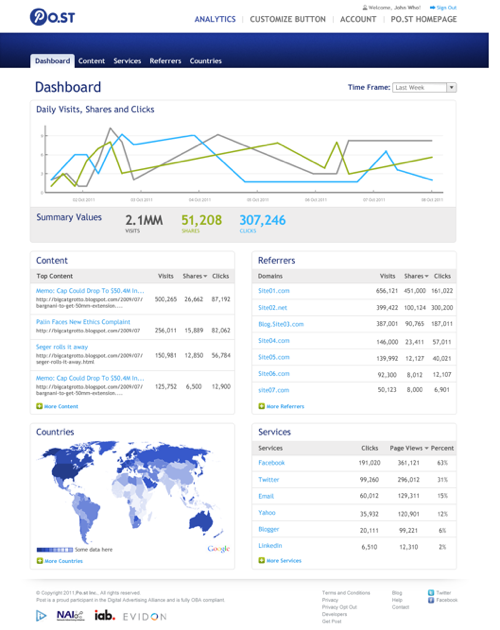 Using Po.st, publishers can get analytics on what their users are sharing, and more data. RadiumOne says that publishers can get the code and integrate with Po.st in less than 10 minutes. Already, over 1,000 sites reaching over 250 million monthly active unique users are using Po.st, including Weather Underground, yFrog, CouponTrade and Dictionary.com, among others. RadiumOne recently debuted its take on the group messaging space, PingMe. And the company just raised $21 million in new funding at a $200 million valuation.